There's an old adage that warns against passing judgment based on appearance, but female bluefin killifish, like many animal species, apparently don't share such human wisdom when choosing a mate. Researchers at the New York University Polytechnic School of Engineering found that female killifish tend to prefer males with a specific fin color: yellow. The preference for yellow was surprising given prior experiments by other groups. The reason may lie in the engineering-based, repeatable approach taken by the researchers. They substituted the notoriously erratic live male bluefin killifish with replicas that were controlled by a robotics-based platform. Maurizio Porfiri, professor of mechanical and aerospace engineering, led the team, which included collaborators from the University of Illinois at Urbana-Champaign, where the experiments were conducted. Porfiri has long used biomimetic robotic models to understand animal behavior, particularly that of fish, and his experiments demonstrate the validity of deploying robots as controllable stimuli amid live animal counterparts. In nature, male bluefin killifish exhibit three distinct color morphs, or forms: blue, red, and yellow. However, it is difficult to determine whether color impacts the males' strategies for attracting a mate, and even more challenging to test whether female fish respond differently to the various color presentations because male behavior varies widely in testing environments. 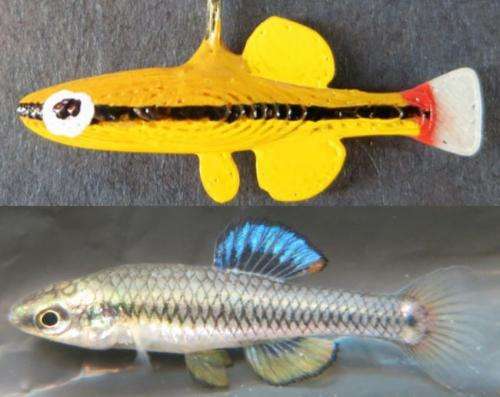 Porfiri and his collaborators built a robotic platform equipped with replicas inspired by the body size, aspect ratio, colors, and motion pattern of adult male killifish. They designed an experiment to expose fertile female killifish to the various robotic replicas in a divided tank. The researchers controlled the replica's movements via a robotic arm, performing the typical motions associated with male courtship behavior. "The benefit of using a robotic platform is that we can standardize the stimulus, or in this case, the 'mating dance' of the killifish," Porfiri said. "We eliminate the other variables that you would normally see when dealing with live animals, allowing us to focus just on the male's color and whether it has an impact on the female's preference." The researchers released fertile female killifish into the tank and measured their behavior in five separate sets of trials. 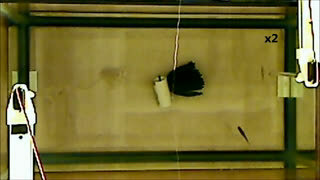 In one control setting, the robotic arm was present but unmoving, and no biomimetic replica was attached. In the second control setting, the robotic arm moved, but without a replica attached. In the three experimental conditions, the researchers exposed each female to one of three fish models designed to replicate the variation in color naturally present in male killifish. A webcam recorded the amount of time each female spent swimming in the various compartments and their proximity to each color replica. Analysis of the video revealed that the positional preference of the female killifish was influenced by the presence of the fish replica. Females were more likely to swim in the section of the tank containing the yellow-colored replicas than the moving robotic arm without a colored replica. "The only trials in which the female spent long time periods swimming near the replica was when the mate was yellow," Porfiri said. "In the presence of a yellow male, the females were actively engaged, swimming parallel to the replica and darting back and forth between the mate and the nest," he said, referring to a sheltered section of the tank. Porfiri and his team noted that, unlike previous studies in which killifish females showed a slight preference for blue or red fins, the yellow pigment used in these trials may be perceived as a "superstimulus," resulting in the females' preference for yellow mates. Other species, notably mosquitofish, have also shown a preference for yellow pigmentation in males, an indication of a higher hierarchic position. The team plans to deploy a similar robotic platform for future studies of mating behavior in this species, including explorations on how locomotory patterns and visual feedback impact killifish mating preferences.